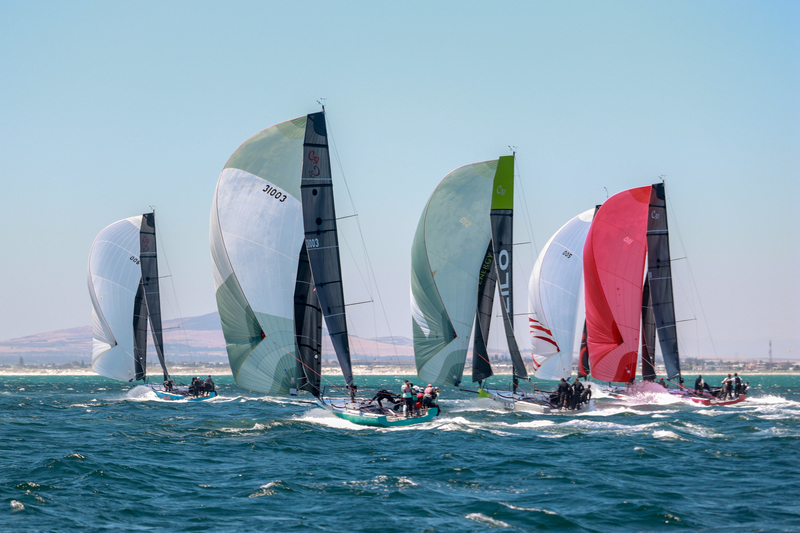 After what can be described as a regatta of variables, Tina Plattner and Tony Norris’s TNT did enough on the last day of racing to take the honours for the 2019 Cape 31 Invitational. 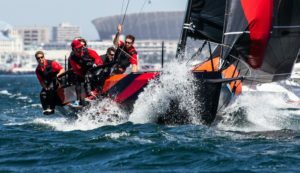 The regatta featured teams representing Sweden, the United Kingdom, Hong Kong, South Africa and Namibia, with Capetonians Malcolm Hall and Roger Hudson on Magic taking up the runner up spot with fellow Cape Town sailors Dave Rae on Nitro finishing third. 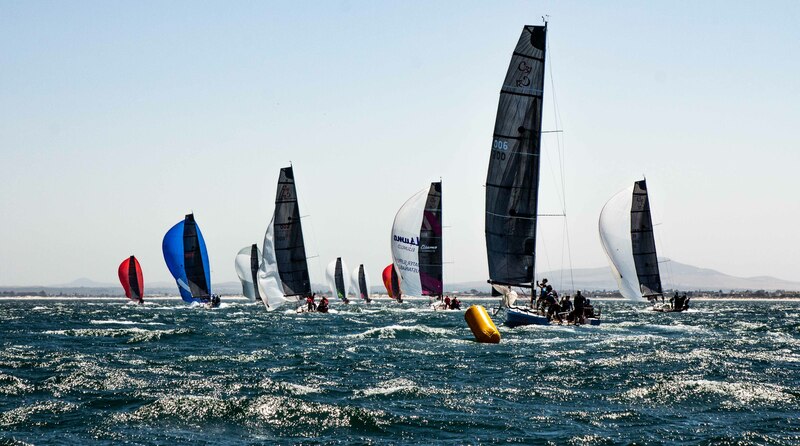 Sponsored by the V&A Waterfront and the Western Cape Government, the Cape 31 Invitational is the brain child of Lord Irvine Laidlaw, and is fast becoming a regular feature on the Cape Town sailing calendar. 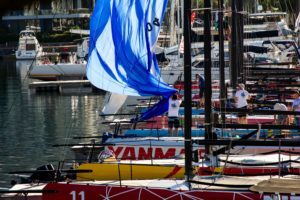 Day one started in a steady South Westerly breeze of 10 – 15 knots with the fleet sailing on the Atlantic seaboard side of the city, TNT instantly laid down the gauntlet with three bullets on the opening day. The next day the fleet headed out to a windless Table Bay with a promise of a strong South Easterly which became too strong, leaving the race committee very little time to get a race in before the wind became too strong. Cape Town team Magic showed their mettle in the trying conditions with a hard fought race against TNT with Nitro taking up the last podium spot. On day three, and the final day of the regatta, it looked doubtful that any racing would happen with the Cape doctor howling in Table Bay with the white table cloth cloud pouring over the mountain. Race Officer Doug Alison wasted no time in getting the bridge boat out to the race course and set up the buoys under the protection of the mountain with some gusty conditions ranging from 10 to 25 knots. As one competitor commented, “you could have sold tickets” the racing was so exhilarating offering some classic wipe outs and smooth boat handling from the top teams. After three general recalls, the RO went for the U flag, with Mike Bartholomew’s Tokoloshe falling foul of the rule which instantly disqualified them for the race. Magic was certainly challenging the top spot from TNT with another bullet in race 5 the penultimate race of the regatta. This meant teams could drop their worst scores. Race 6 started after a short break with the U flag once again displayed, unfortunately the Swedish team Elvis were over the line and had to leave the race course. 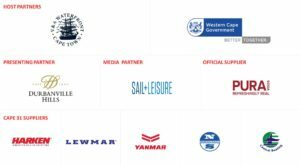 The Cape 31 Invitational could not have happened without sponsors V&A Waterfront and Western Cape Government, our supplier partners Harken, Central Boating, Lewmar, North Sails, Seascape Marine and Yanmar.